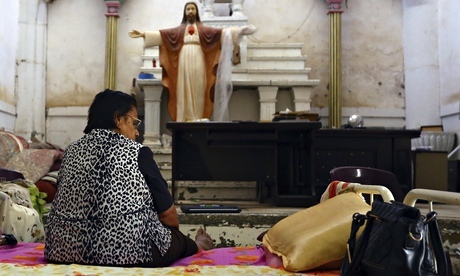 For the sake of our fellow-Christians in Mosul, we should keep our outrage burning brightly. The thugs of ISIS are murdering Christians by their tens, burning the churches. They mark their houses with “N” (for “Nazarene”) and occupy them for themselves. Some commentators claim this is the worst pogrom since the Nazis put yellow stars on Jews and rounded them up in Germany. To bring Christianity in Mosul to an end is a tragedy of the worst kind: Christians have been there since just after the time of Christ. They still speak Aramaic, the language of Christ. ISIS is destroying the community’s ancient irreplaceable texts. The purpose of ISIS is clear: to wipe our Christianity in Iraq and all historical traces of it. It is shaping up to be a massacre of a people and the death of a culture. As a Christian, I burn with a sad anger to see brothers and sisters in the process of becoming martyrs. As a teacher of World Religions, I am aware also that for most Muslims, the actions of ISIS is shameful. Their casual cruelty is foreign to Islam, which values human life and respects the People of the Book. ISIS, like some extreme Christian groups, believes shrines and images lead people away from God. On July 24 this year, for example, the Islamic State levelled the tomb of Jonah in Mosul. This is as incomprehensible to most Muslims as Cromwell’s wanton destruction of English churches during the Revolution is to Christians. The respected Washington Post, for example, wonders whether the destruction of shrines is to gain media attention. The answer is, I think, only as means to teach Muslims of the perceived dangers of these artefacts. These fundamentalists believe that they deceive people by promising to help them get closer to God, and they are prepared to destroy even the most valuable so that people can have simple direct access to God. There seems so little that we can do from here in Australia. But I would suggest three actions. Appreciate our freedom to worship. Thank God for it; and, if the occasion arises, express our appreciation to our civic leaders. Stand in solidarity with our fellow-Christians in Mosul. Pray for them and with them. Get on board with the Act for Peace (Christmas Bowl) campaign. Spread the word. Talk about the massacre that is occurring in Mosul with your friends. Re-post this blog, or other blogs about it, or link to it.